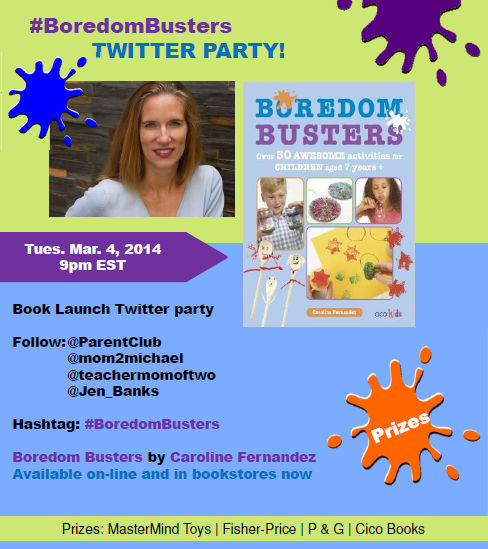 It's the #BoredomBusters Twitter Party! When I first started blogging a little over eight years ago, I never would have imagined that my virtual relationships would transform into real friendships. I have worked with so many amazing writers and have had the opportunity to meet them in person and establish a true connection with some of them as well. And as is often the case, I am truly in awe of the work they do. So, whenever my blogging friends set out on a goal and achieve that goal, I am over the moon. That is exactly how I felt when my friend Caroline Fernandez told me that she signed a book deal. Yes, a book deal! She is now the published author of Boredom Busters. In the meantime, if you'd like to purchase a copy of the book in time for March Break madness, you can purchase Boredom Busters on Amazon or on Indigo.ca. This looks lovely. Do we have to RSVP? No RSVPs needed :) Just tweet us with the hashtag. See you there! Thank you so much for the support! Total proof on-line meetings can turn into real (and dear) friendships. Looking forward to party-ing with you on twitter! Congrats on your book launch!! You're a wonderful writer and I hope your book reaches many people!